The HP 255 G2 lacks any bells and whistles, but works really well as an entry-level system. It goes without saying that the HP 255 G2 isn't a computer intended for any kind of heavy use. Sporting a particularly low-power (and inexpensive) processor, AMD's quad-core E2-3800, HP has designed a laptop that will have precisely zero appeal to anyone who wants a computer for tasks such as heavy design work, gaming, video editing, graphic design or any other demanding computing activity. But it's a 15-inch laptop that costs as little £226 ($365, AU$407) at Ebuyer, and it's enough for the simplest tasks, such as web browsing and word processing. There are a lot of potential customers for inexpensive computers in both education and businesses with limited IT budgets, not to mention plenty of people who don't need a particularly capable computer, and want to spend as little as possible on it. It isn't just HP that sees a market for these type of machines. Microsoft has just announced that it plans to support a range of low-end, affordable computers, which has always been Google's aim with its Chromebooks. Windows 8.1 with Bing will be a low-priced version for OEMs to bundle with cheaper systems, where in exchange for lower fees, they agree to make Bing the default browser search option. HP already has a few similar offerings. 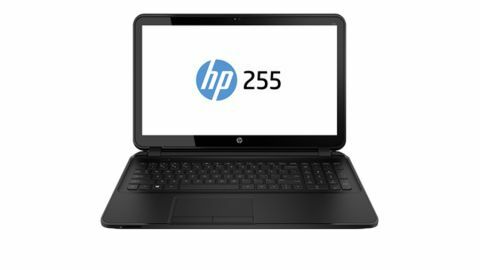 The HP 255 G1 came with Ubuntu Linux, for further cost reduction, but Linux can be a tough learning curve for many people, especially the very value-conscious customers the 255 is aimed at, so it's been swapped out for Windows 8.1 in the G2 version. There are also variants with Intel Celeron processors rather than AMD. There's absolutely nothing swish or fancy about this machine's design. It has a chunky plastic shell and the display isn't great, with a very narrow viewing angle. From above, it's completely impossible to see what's on the screen, which is particularly jarring if you've used a modern IPS display. It's also quite heavy. It's fully functional though. Sensibly, HP hasn't made the crucial mistake of skimping on memory, providing a full 4GB of 1600 MHz DDR3, unlike other firms who save a few quid by only including 2GB with their low-priced systems. With less than 4GB of memory, Windows will noticeably struggle, loading times will be significantly increased, and sooner or later, the computer will have to start swapping to the disk, and become unresponsive. But this just doesn't happen with the HP 255 G2. The keyboard is perfectly adequate as well. It has the usual "Scrabble" keys, which are perfectly sized for most hands, and there's a full number pad to the side as well. The trackpad is ok, with physical left and right-click buttons. It has a 500GB hard disk, which is plenty of storage for basic use. There's also an optical drive, VGA and HDMI display outputs, Ethernet, a single audio output and three USB 2 ports. Plus a webcam and an SD card slot. Luxuries such as 802.11ac wireless, DisplayPorts, USB 3.0 and solid-state storage are obviously absent, which is perfectly forgivable for the asking price, and are unlikely to be particularly missed by the type of value-conscious customer HP is targeting. So far, this all sounds reasonable, but the HP 255 G2 performed particularly badly in benchmark tests, and achieved some of the lowest scores I've recorded from a full-sized laptop in the last twelve months. The 1.3GHz AMD E2-3800 can't keep up with Intel's Core processors, and the integrated Radeon HD8280 graphics card isn't exactly intended for high-end gaming. Intel's Iris graphics chips blow it away. In Cinebench 15, the HP 255 G2 scored just 102 points in the CPU test, and it managed 11.03 FPS in the OpenGL test. In PCMark08, the HP 255 scored 1,306. That's only 10% more than Acer's Aspire Switch 10, a 10-inch Intel Atom hybrid tablet severely constrained in terms of thermal and physical space. 3DMark scores weren't quite as bad, with 24,570 points in the Ice Storm benchmark. While that's less than half the score achieved by a laptop with an Intel Iris GT2, it's still just about sufficient for older games. So with this low performance, what software can the HP 255 G2 run well? Quite a lot it seems. Microsoft Office won't cause any problems, and for teaching coding, while the full Visual Studio package may be slightly excessive, using software such as Notepad++ and Python will be perfectly fine. You'll also get by with lighter design tools such as Adobe Photoshop Elements, or a free alternative such as GIMP. But really, don't even consider a heavyweight video editing package such as Adobe Premiere, as it will truly sink the HP 255 G2. I measured battery life as well, again using PCMark 08, with an overall time of 3 hours 41 minutes. This isn't spectacular, but PCMark08 is a tough test that doesn't fully drain the battery to zero, so there was still 15% remaining at the end. Of more concern was the time it took to recharge. After being plugged in for well over an hour, the battery was only 22% charged. Fan noise was definitely noticeable too. Although it's hardly deafening, at idle there's an audible whir coming from the laptop, but unless you start encoding HD video on the HP 255 (which really isn't recommended) it won't be a problem.